[Excerpts from sermon preached Labor Day weekend 2014 at Disciples Christian Church in Cleveland Heights, OH]. On any given work day, Jannette Navarro, a 22 year old Starbucks barista and single mom, tries to put the pieces together for another last minute plan. We know about Janette’s work issues through a recent interview for the NY Times. At the time of the interview she was working on a plan for surviving the month of July without setting off a financial disaster – or a family crisis. 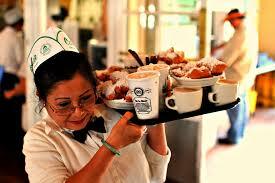 That said, Janette was grateful to have been hired as a barista at Starbucks for $9 per hour. She got the job largely due to her persistence. She just kept showing up. Always cheerful. Asking for work. The barista job was definitely a step up from working at the Dollar Tree and KFC, her two most recent jobs that she held simultaneously. Before that she was on public assistance, and determined never to go back on, she was just a few credits shy of an associate degree in business. Listening to the other baristas talking about getting their masters’ degrees, Ms. Navarro began to think about that possibility for herself. But her take-home pay was rarely above $400 every two weeks. If she got to $500, it was a celebration. Even so, since starting in November, she had managed to set aside $900 toward a car – her next step toward stability and independence for herself and her 4year old son, Gavin. But if she could change one thing about her job, it was the issue of her fluctuating hours. She felt like she was in constant clock crisis. She rarely knew her schedule more than three days before the start of a workweek. Which made it next to impossible to figure out child care. She’d been living with family who helped out with her son, but they had jobs too – some of them with unpredictable hours. She couldn’t cut back on her hours. Sometimes she needed the dimes from the tip jar to make the bus fare home. She didn’t want to rock the boat by asking for more stable hours. 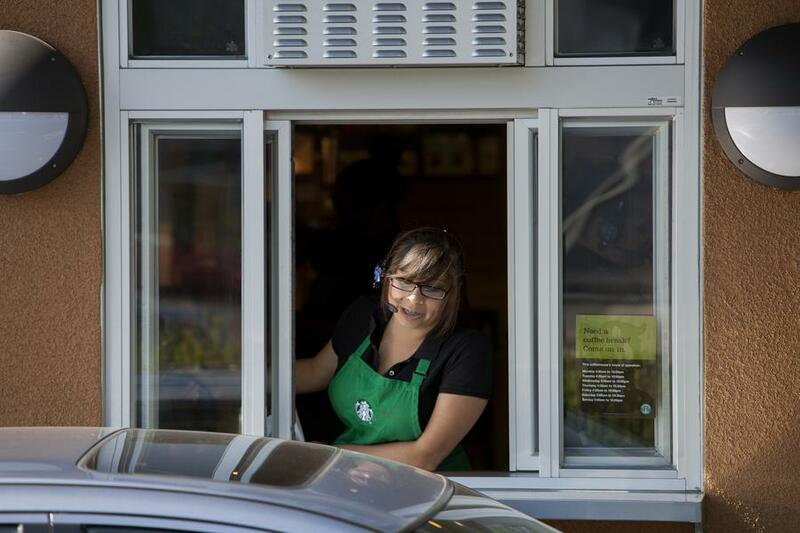 Starbucks is one of an increasing number of corporations who are using a scheduling software program called Kronos. The software developer says, It’s like magic. Helping large corporations like Starbucks choreograph their workers hours. It’s a choreography that boosts profits and cuts labor costs with just a few keystrokes. It’s good for the bottom line, and it’s good for managers who are compensated on the efficiency of their staffing, but the effects on employees can be devastating. In Ms. Navarro’s case, even the amount of sleep her son Gavin would get was controlled by her job. On July 4 weekend, she worked until 11 pm on Friday. She reported in again on Saturday at 4 am. And Sunday morning, she reported for work at 5 am. In Starbucks defense – I know there are a lot of Starbucks fans out there – they are not the worst employer out there. Sometimes, they argue, variable hours can be a plus. They point out that they provide benefits like health care, 401K with matching contributions, and tuition for online degrees. Many retailers fall far short of this. But not all is as it seems. 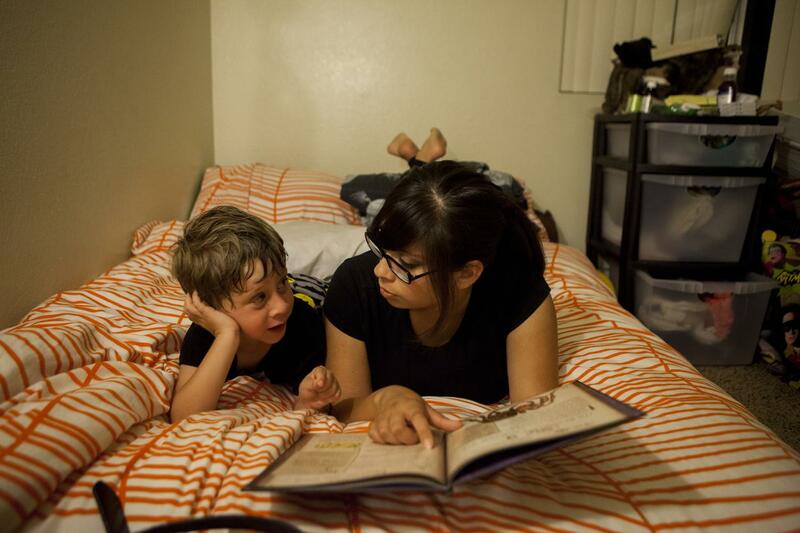 Ms. Navarro said she was just 3 classes shy of being able to transfer her credits to take advantage of the tuition offer when she had to drop out because of her unpredictable work schedule. I should mention that since this article appeared in the NY Times and on NPR and in other news outlets, Starbucks has agreed to look into the issue across the board in their stores. Work issues. Who doesn’t have work issues? Thursday was a day when I saw lots of my church folks. People who were in the building during the day, lunch with a church member, a hospital visit, the volunteers in the kitchen for the community meal, Connections band rehearsal, and a meeting in my office on Thursday evening. I wasn’t consciously conducting a survey about people’s work issues, but I sure got an earful about them. One was worried about his job being cut. Through no fault of his own, there just aren’t enough clients to serve. Another is responsible for the care of her parents, exhausted from going to the hospital right after work, staying until bedtime, getting up and doing it all over again the next day. I just can’t take any more time off. I’ll lose my job. Another who is working two jobs said I haven’t seen my family in three days, I’m up and out the door before they even wake up, and they’re in bed when I come home. Another said, doing home daycare is exhausting at my age. My new position is OK for now, said another, hinting that she’s probably looking for the next job. A career teacher said, I’d do anything else. Anything. And it’s just the first two weeks of classes. Work issues. The only time you don’t have work issues is if you’re not working. Except if your not working is not by choice and you need and want to have a job. I had those conversations here at church this week too. The conversations weren’t all negative. There were at least a couple of people who were content in their work. I’m super busy this time of year. But it’s a good kind of busy. Working in his field of study. Paid well enough. I wouldn’t want to leave. And of course in this church – and in any church – there are some who choose to not work outside the home, and many who have already built their careers and are retired. You might think they are exempt, but I want to make the case that all of us are subject to work issues. 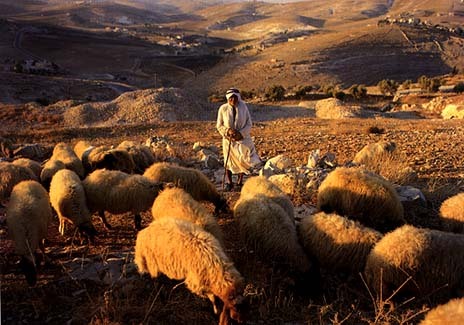 At this stage in his career in Exodus Chapter 3, Moses was working as a shepherd. Shepherd was not a job one aspired to. It was dirty work with lousy hours, and I’m not sure it even qualified as a low rung on the ladder to success. That said, Moses may have felt fortunate to have even that job. He was an immigrant for one thing – having fled his own country. He was a job market pariah – equivalent to a convicted felon in today’s job market – he fled because he murdered someone. But things were looking up for him. He found a new life. He got married and was a father. And his father-in-law got him a job this shepherd’s job. Maybe things weren’t so bad after all. Things were going well enough that maybe he’d forgotten the life he’d left behind. Maybe he’d forgotten the people he left behind. He wasn’t concerning himself with the oppression the Israelites were suffering. Moses might have forgotten, but God had not. Forgotten. And God has some powerful ways to make sure that we don’t forget either. God got Moses attention in a big way – God’s voice coming from a burning bush that refused to burn itself up, right there in front of him. It wasn’t enough for God that Moses was OK with his job. God knew he could make a difference in the lives of others. So God called him out to do something more than just take care of himself. When I began preaching Labor Day sermons about 20 years ago, it seemed very different. I most often preached about call and vocation. I’d quote Frederick Buechner who said: The place God calls you is the place where your deep gladness and the world’s deep hunger meet. I’d preach about finding the place where your gifts and talents match with the needs of the world. And somewhere along the way, I realized that there are few people – and fewer all the time – who have the privilege of finding that place and being paid to work there. Not because they don’t want to. But because they don’t have the resources or the time or the opportunities to do anything other than what they’re already doing. I realize now that there is a vocation privilege for some like myself, but for many more others, they see very little of God in their work week. I don’t want to give up on call and vocation, but we need to re-think them. God hasn’t given up on them. God hasn’t given up on opportunity for all. God hasn’t given up on those who haven’t had the privilege of finding it. God still calls us. God calls us to be looking out for and taking care of each other. That call may come in the life-changing, awesome moment of a burning bush – though probably it will not. More likely, God’s call will be more a nudge, or butterflies in your stomach, or a persistent tap on the shoulder. Maybe a quiet whisper that says: maybe we ought to be doing something about a particular issue. Current issues are more than the stars. Today we’ll limit the conversation to issues of the workplace and the marketplace – for they are related. God is calling us to do something about the inequities and the injustices, the disrespect and disloyalty. Even if we like our job well enough. Even if as a manager or a business owner the bottom line is looking good. Even if our working years are behind us. Work issues are still our responsibility. Like they were for Moses (with a not-so-gentle nudge from God). The Apostle Paul also has something to say to us about involvement. Don’t be fooled by the word hospitality – this is about more than coffee and donuts. Paul lived in an unjust world as do we, and in such a world with million living below the poverty line, genuine love demands our involvement. Loving our neighbors can mean standing with people who do not make a living wage, who must rely on SNAP benefits even though they are working full time. Being ardent in spirit can mean using our energy and resources to fight for things like family leave and sick time. Showing honor is about treating people well – the people who work for you, people who serve you, wait on you, who count on tips to survive. Persevering in prayer can mean taking that conversation you have with God a step further by paying it forward for someone who’s too tired and discouraged at the end of a work day to have much to say to God. A preacher friend of mine said recently that moving from the story of creation in Genesis and the beginning of the story of the people of God seems to come to an abrupt halt when we start to read Exodus. That the subscript to Exodus could be: now everything gets worse. It seemed that way on Thursday for many I talked with. When the job we have isn’t what we want. Or the job we want won’t have us. Is it that person’s issue – or is it an issue we share together? Remember that Moses made it his issue, even though he had escaped and found better work. Moses didn’t ignore God’s call. He didn’t shrug it off a tap on the shoulder only to go back to watching the sheep graze. And it took awhile, but he rescued those people, and to say their work situation improved, would be putting it mildly! Our work situations vary here at Disciples from those too young to work and those long since retired, to everyone in-between – one thing we share. We are all called by God. Not one of us is uncalled. An uncalled life assumes an autonomous existence in which we have no one either to help us when we struggle or to leave us alone when we’re doing just fine thank you. An uncalled life is one in which no one calls us out by name or cares that we’re there. But that wasn’t the shepherd named Moses. It wasn’t what Paul preached. And it wasn’t how Jesus taught, lived, or died. And it’s most certainly not us. And what God calls us to is to make the world a more humane, just, and loving place in which to work and live. This entry was posted in Activism, Labor Day, Uncategorized, Work Issues and tagged Jannette Navarro, Starbucks, The Apostle Paul. Bookmark the permalink.